Life with a cat isn’t all snuggles and dangling feather toys. Experienced cat owners can attest to the scratching, random darting across the room, and the cat hair (oh, the cat hair!). Fortunately, thanks to the internet, innovative ideas are quickly spreading to help make cat parenthood easier. Whether you’re bored, on a budget, or looking to solve some problems, these cat-friendly life hacks will help make you and your cat’s life better. This is a great solution whether you don’t have room for a cat scratching post or want to protect your furniture from a frisky kitty. Purchase sisal rope and tightly wrap it around the legs of your desk, dining table, or coffee table (or all three!) 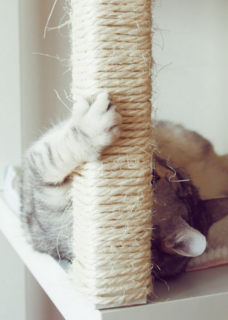 to provide convenient, inexpensive scratching posts for your cat. What better way to provide some entertainment to your cat than with items you already have in the home? 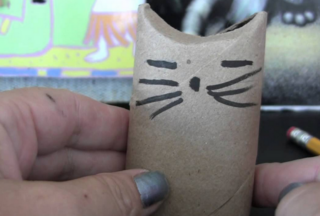 When you reach the end of the toilet paper roll, don’t toss the cardboard tube just yet! Pinch the end and drop in a few kibbles or sprinkle a little catnip inside, then pinch the other end closed and offer it to your cat for some fun on a budget. If your home is plagued with cat hair like most cat lovers, you can try this easy trick to remove it from furniture and upholstery. Simply put on a rubber glove and run your hand over the surface – the hair will ball into clumps that you can pick up and toss in the trash. 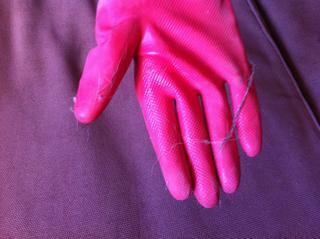 Some suggest slightly dampening the glove, so try both ways to see what works best on your furniture. Have an old t-shirt that you no longer wear? With just a couple of wire hangers and some cardboard, you can create a homemade kitty hideaway. 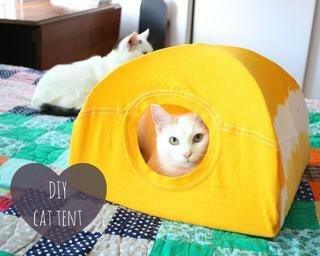 See the detailed step-by-step guide by Instructables on how to make a t-shirt cat tent. If you’ve got a kitty who’s crazy for catnip and are tired of buying new cat toys, we’ve got just the trick—all you need is a bag of catnip. 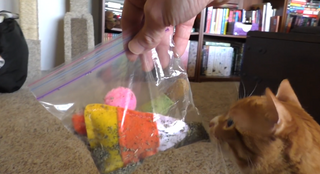 Put an old cat toy in the bag and let it “marinate” overnight so it can absorb the catnip magic. 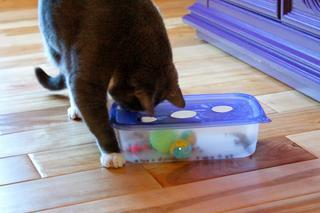 The next day, watch in amazement as a boring toy is suddenly fun to your cat again. By nature, cats enjoy having a high perch to which they can escape and survey their surroundings. 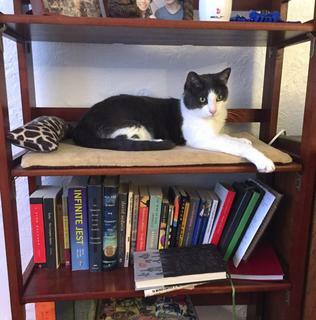 If you don’t have a good cat perch or want to redirect your kitty’s habits of jumping on the countertops, simply clear off a shelf on your bookshelf. Set down a cozy pad to create a soft kitty retreat. The ancestors of your cat hunted for their food, and your cat would enjoy a good challenge during mealtime as well. You can provide some stimulation and enrichment to your cat by making a puzzle toy out of an empty plastic water bottle. 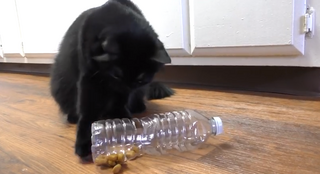 Cut holes in the bottle that are big enough for your cat’s kibbles to pass through, then fill the bottle with kitty’s dinner and watch her bat it across the floor to free the trapped food. Keep kitty from walking through potted plants (or worse—using them as a litter box!) 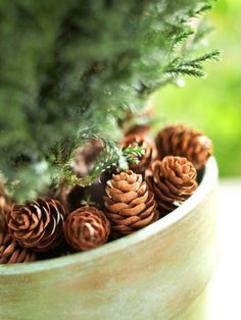 by putting pinecones on the exposed soil. This deterrent is cat-safe, but unpleasant for your cat to walk on, which should help protect your plants from a mischievous kitty. Got a cabinet overflowing with reusable plastic food containers? So long as you can find the matching lid, you can turn one into an interactive puzzle toy using the toys and kibble you already have. You’ll need to get hands-on with a utility knife and scissors; the trick is to burn jagged edges with a lighter to smooth them out and protect kitty paws. See The Glam Cat’s full tutorial.